Period is using Smore newsletters to spread the word online. This is an interesting tale of legends. It leaves you on the edge of your seat. It has everything from a headless Hessian to a woman who screams before a snow storm due to horrifying memories of her death. It truly is a terrifying tale by Washington Irving.The folk tale has carried on through decades scaring those who read it. 1.) Ichabod encounters the headless hessian. To escape the death of which the hessian may inflict he runs to the Van Tassels home. 2.) The Van Tassels are hosting a party. Ichabod meets Katrina Van Tassel. He thought she was beautiful. 3.) The second meeting between the Headless Hessian and Ichabod. 4.) The legend is told about the woman who screams before each snow storm due to awful memories of her death. 5.) The third meeting between Ichabod and the headless Hessian when Ichabod tried to go on the bridge. 6.) The story ends with the headless hessian charging after Ichabod. Things you believe can’t be true, might be. The actor is Johnny Depp. Ichabod Crane is the man who encounters the Headless hessian. this is the creator of The Legend of Sleepy Hollow. 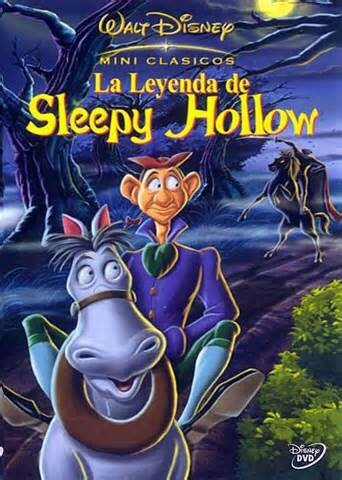 Disney has also done a Sleepy Hollow movie themselves. tis he whom encountered Ichabod Crane. 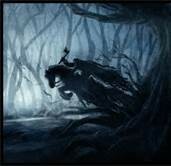 He is also known as the headless horseman. 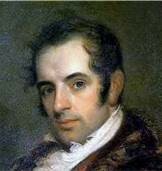 this is the cover to the book by Washington Irving. the book is based on a real place and real legends. The characters such as Ichabod Crane and Katrina Van Tassel are fiction same with the encounters. This is the daughter of Dutch Farmer. 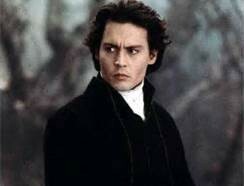 Ichabod Crane Falls in love with her.